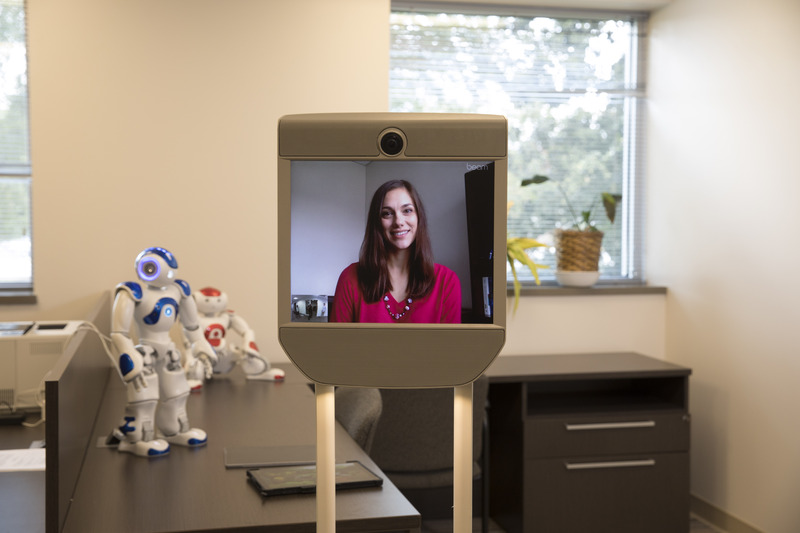 Jenay Beer has been thinking about how people interact with robots since she was a kid. She grew up watching Star Wars, fascinated by the way R2D2 “beep-booped” his way through conversations with other characters, and The Jetsons, where Rosie wheeled about, frenetically managing the family’s futuristic home. Now, as an assistant professor and researcher at UGA’s Institute of Gerontology, Beer studies how robots can best meet the needs of an aging population. It turns out that assistive robotics is catching up to the imagination of Hollywood, and Beer is at the forefront of the field, discovering how to best adapt robots for home and health care settings. An engineering psychologist by training, Beer asks a lot of questions about the suitability of robots designed for human interaction—what might drive a person to want to adopt a robot? What tasks should, could and will the robots perform? How might robots be used and potentially misused? For older people, who are experiencing cognitive decline or physical impairments, these questions are particularly important. In Beer’s latest project, she is working with colleagues at the Institute of Gerontology to deliver a unique form of memory support to older adults with dementia. “We’re programming a robot to deliver cognitive training in the form of piano lessons,” she said. 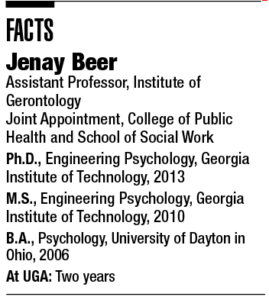 Throughout her career, Beer has worked with colleagues in psychology, computer science, engineering, social work and gerontology. And her role at UGA is no exception. In addition to being a faculty member in the Institute of Gerontology, she holds a joint position in the College of Public Health and the School of Social Work. The interdisciplinary nature of her appointment reflects the collaborative spirit of her research and her teaching style. Beer teaches graduate-level interdisciplinary courses on smart technology and aging where students are encouraged to bring their diverse knowledge and skill sets to the table. “It gives me an opportunity to constantly learn, particularly from my students who may have a different perspective on technology and aging,” she said. Students in her “Smart Technology in an Aging Society” course work in teams to develop prototypes for devices or apps for older adults. Last semester, one group designed a sneaker that could predict a fall. Another group proposed an app for tele-veterinarian care for older adults who couldn’t drive their pets to the vet’s office. Beer says she’s inspired every day by her students, and she hopes they are gaining the skills and confidence to think outside the box both in the classroom and in their future careers.